We challenge any Heating Competitor to beat our performance! JetHeat offers the ONLY Micro Turbine powered portable heating solution in the world. The GT 1400 utilizes patented technology to meet your heating needs. Better by Design. Save time and money with the JetHeat GT 1400. It produces heat faster using substantially less fuel than any other competitive product. Better by Design. JetHeat’s patented technology produces clean, breathable, odorless air. Carbon neutral, it It emits minimal NOx, SO2, and other greenhouse gasses. Better for the planet. Better by Design. High static pressure and high volume, the JetHeat GT 1400 is powerful and efficient. It is flameless, modular, compact, and portable with a small footprint. We guarantee that we will surpass the competition in performance. Better by Design. Whether it’s a drilling rig sub, BOP, pipe barn, bypass valves or fracking tanks, if it needs heating, freeze protection or thawing, the JetHeat GT 1400 can do the job quicker, cheaper, and more efficiently than competing products. Melt away obstacles to productivity by using JetHeat. Flood or water damage can prevent dwellings or buildings from being habitable. Time is money. The heat and static pressure capabilities of the JetHeat GT 1400 make this an ideal solution for drying wet spaces…quicker than anything else available. Need to keep a construction project on schedule? Winter slowing you down? JetHeat allows you to overcome those constraints. Keep workers and equipment warm by utilizing a JetHeat GT1400. Our heater is very effective at curing concrete, thawing the ground or heating interior spaces quickly and efficiently. No power? No problem. 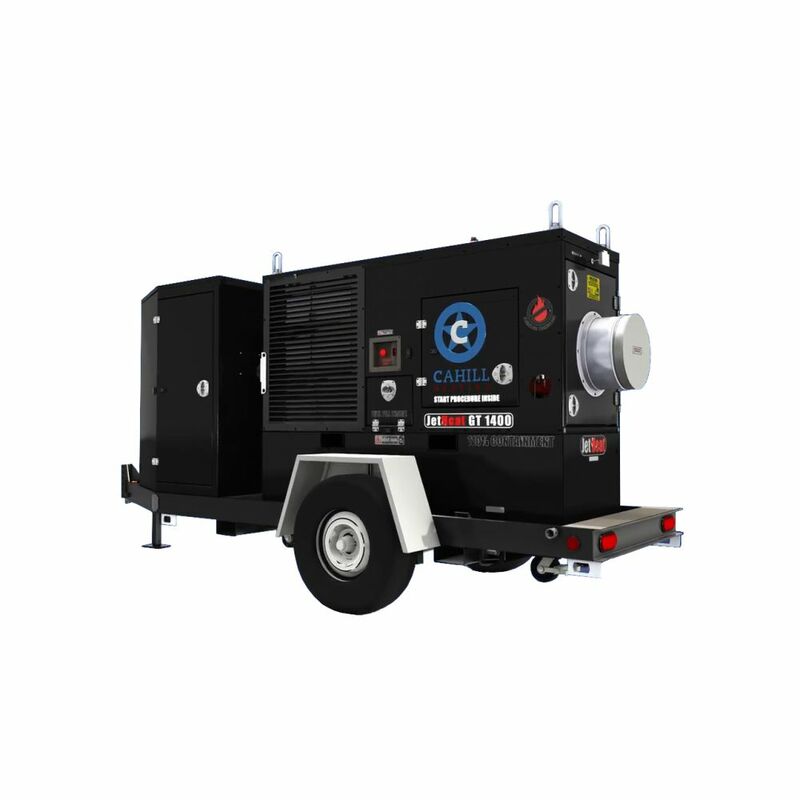 If your business needs a temporary heating source, the JetHeat GT 1400 is the answer. It pushes heat a long way and provides clean breathable air. Use the best heater in this market segment. If you don’t believe it, let us prove it. Looking to exterminate bugs fast? The JetHeat GT 1400 is eco-friendly; meaning no chemicals, toxins, or poisons where humans eat and sleep. Kill bugs and eggs while keeping your structure and its contents safe during and after the treatment. JetHeat can eradicate infestations quicker than competitive products. We solve heating challenges. If your business has a heating need, JetHeat has a solution. Contact us with your heating challenges and let us problem solve. JetHeat’s GT 1400 creates heat faster, cleaner, cheaper, and more efficiently than others in the marketplace with its patented design.